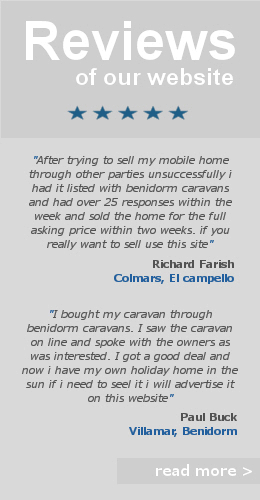 Camping Almafra Mobile Home Sales. SOLD SOLD SOLD! Fully equipped 2015 Delta Santana Static Caravan for sale on the Costa Blanca, Spain – Camping Almafra Caravan Park in Benidorm. This Mobile Home is less than 9 months old with factory fit upgrades such as PVC double glazing, additional underfloor insulation and comfort sofa. This Mobile Home is sited on one of the most desirable positions of the Caravan Park. The pitch has 360 degree mountain views and is near to all campsite amenities. The site fees for this pitch are just €2300 per year! 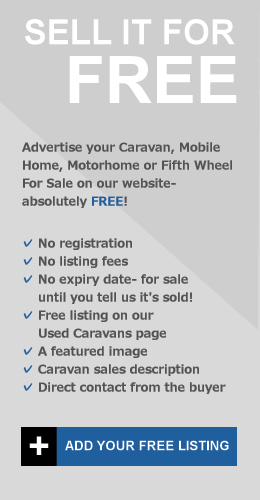 Inside the Mobile Home there is an open plan lounge/diner/kitchen at the front with double sofa bed, 40″ flat screen TV, Sky TV box with UK channels, fridge freezer & microwave all included in the sale. At the rear there are 2 bedrooms ( 1 twin & 1 master double) and a fully fitted shower room & toilet. The master bedroom benefits from a brand new air-conditioning unit. The outside of the Mobile Home has been designed to make the most of the stunning mountain views. There is a large decked area to the front and an enclosed paved area at the rear. To the rear there is a utility room with washing machine and an extra chest freezer. This Mobile Home is ready to move into in a sought after location. To avoid disappointment, an early viewing is highly recommended.